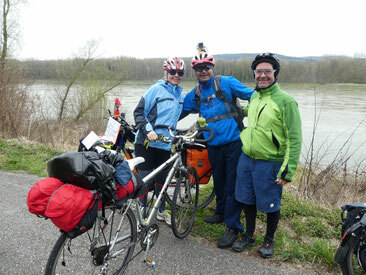 Despite of headwind and fresh temperature we arrived in Vienna March 23. The first 1000km are behind us. Let’s resume what happened in-between… In a small little town we realized that surprisingly many tourists were around with their cameras although it is not yet tourist season and the town as such was not that extraordinary. Some time later we got the explanation: a Donau Cruiser had anchored. Meanwhile we have discovered to stay overnight in bead & breakfast instead of in hotels. The advantages are: very nice rooms, friendly hosts that can tell us interesting stories about their guests and give us advice about local places to eat. At our arrival in Grein one Lady was even cleaning our bags, most probably more to her advantage so we didn’t bring the dirt into the sleeping room. In Mautern we have been welcomed with a “Marillen Schnaps”. Even Marie-Claire liked it although she usually doesn’t drink any Schnaps. In Mautern we went to the first “Heurigen”, that’s the place where the Wine makers can serve their new and old wine without a license. There are special calendars announcing when these events take place. Each of us had a quarter of white wine and to eat we had meat and cheese plates with it. It was a wonderful meal for a very cheap price! We never would get anything comparable like that in Switzerland., we can only dream about it. We were very surprised to find out that in Nieder Austria smoking is still allowed in Restaurants although there is a EU regulations prohibiting smoking in restaurants. We have this saying in Switzerland that Austrians are very special….. This week we met the first bike-driving globetrotter Abishek Kumar Sharma from India. He has travelled already through 39 counties since 2014 and continues till 2020. He is promoting a self-sustainable Indian community and collects money for it. Compared to Abishek we realized that with our few electronic gadgets (camera, handy, laptop and tablet) we could not compete with Abishek, we miss at least some geopro’s and additional cameras. We explored Vienna during 1 ½ days for a change not with our bikes but instead walking. We have gazed at many monuments. Spontaneously we attended a parade of the Spanish riding school. An of course to finish the week in a decent manner, we didn’t miss tasting the famous and typical Wiener Schnitzel with potato salad Sunday evening.